Summary: This recipe is so fast and easy that it is truly the best and only raw flax seed cracker recipe you will ever need. Actually we should call it a "3 seed flax cracker" or even a "4 seed flaxseed cracker" recipe, and even with that it will be the easiest, most versatile flaxseed cracker recipe you've ever made. 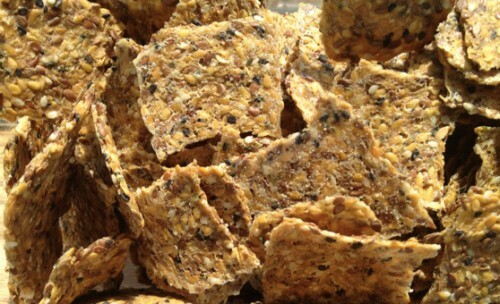 This recipe is so fast and easy that it is truly the best and only raw flax seed cracker recipe you will ever need. Actually we should call it a “3 seed flax cracker” or even a “4 seed flaxseed cracker” recipe, and even with that it will be the easiest, most versatile flaxseed cracker recipe you’ve ever made. That is because in addition to the flaxseeds, you can throw in nearly any other seeds you like (and it will still be just as easy! ), which is why we say that we should call it a recipe for “3 Seed Flax Crackers” or even “4 Seed Flax Crackers”. We like adding sesame seeds and hemp seeds, but you could also throw in sunflowers seeds, chia seeds, pumpkin seeds…you get the idea. This recipe can be made savory by adding any sort of seasoning that you like, but we prefer it just as it is, because as it is you can top it with anything you like, be it savory (hummus, guacamole, etc.) or sweet (peanut butter, almond butter, etc.). 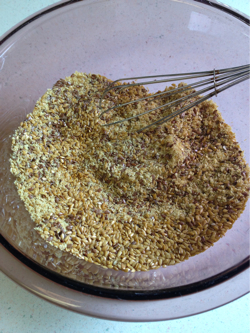 Mix the flaxseed, flax meal, other seeds, sugar, and salt in a bowl with a whisk until well mixed. Stir in the water, and mix well. You will think that the mixture is too soupy, but wait. Let set for five minutes. 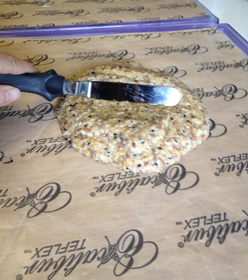 Ladle mixture onto dehydrator trays covered with Teflex sheets . If you don’t have Teflex sheets you can use parchment paper – but do not use waxed paper! You have been warned! 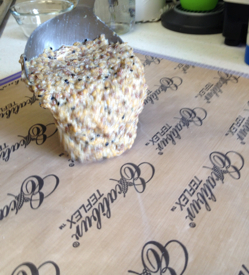 Quickly spread the mixture as thin as you want it – generally the thinner the better, to a point. This recipe made exactly two full dehydrator trays for an Excalibur dehydrator . Let stand 5 more minutes. Score the crackers before putting in the dehydrator; this will make it much easier to break the crackers apart after they are done. By letting the mixture stand for that second 5 minutes, once it is spread on the trays, it thickens up just enough more to allow you to effectively score it. 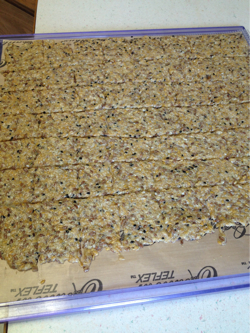 Put in dehydrator at 115 degrees, and dehydrate until the crackers are completely dry. You really can’t over-dehydrate them, and we dehydrate them for at least 24 hours. When they are done, break the crackers apart, and store in moisture-proof container. These are honestly the best flaxseed crackers we’ve ever had. They aren’t at all tough, but they also aren’t so delicate that they break apart. And the flavour and texture are wonderful – not at all too flaxy. Let us know what additions you have made to this recipe! Read Next Article » Gluten-Free Raw, Vegan Fudge Recipe that Doesn’t Need to be Frozen!